The Hunt for Wet October: Stay cool as the weather heats up. The Hunt for Wet October: Stay cool outside as the weather heats up. Most of us think of Australia, and especially Queensland, as having two seasons—really hot and a little bit less hot. Now that we’re in October, we’re just starting to come into the former after a few very pleasant months of ‘less hot’. To avoid melting in the lead up to Christmas, we’ve talked about delicious ideas for frozen treats, as well as how to stay sun-safe while outside. For kids, now is the perfect time to peel themselves off the sticky couch and play in the yard, especially because there’re so many ways that they can stay cool while doing so. Today, we want to go through the most fun ways for the kids to avoid overheating. 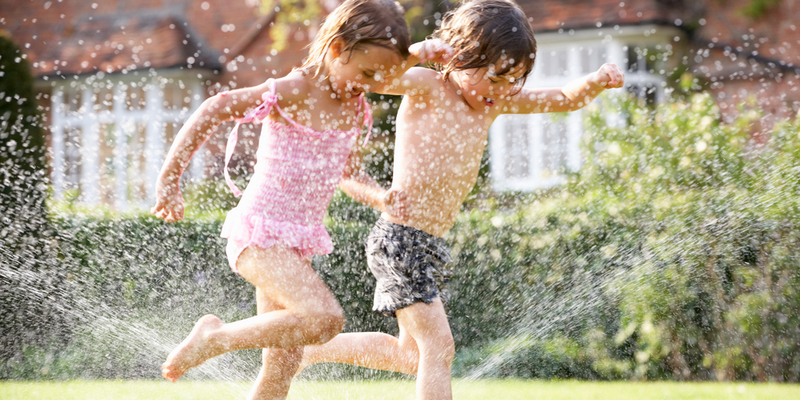 Aussie kids love playing with sprinklers; it’s a fact. Every generation of children has roasted inside the house like the previous night’s dinner, begged mum or dad to plug the hose into that wonderful little gadget, and then put in on the back lawn. Catchment: Give everybody a plastic cup, making sure that they’re all the same size. Everyone stays a few steps back from the sprinkler, and the first person to fill their cup first is the winner! Remember: nobody is allowed to touch the sprinkler, but they can move around to catch more water. Sponge Race: Place an empty bucket for each child at the other end of the yard. Each participant tries to fill up their bucket using only a large sponge and the water from the sprinkler. The first person who’s bucket overflows is the winner! Musical Sprinkler: Play an extra difficult version of musical chairs. Put on some music, and stand near the hose tap. Ask participants to dance around to the music, and only stop when you either turn off the tap or pause the music. Anyone who’s still moving when one stops, is out. The winner is the last child still dancing! 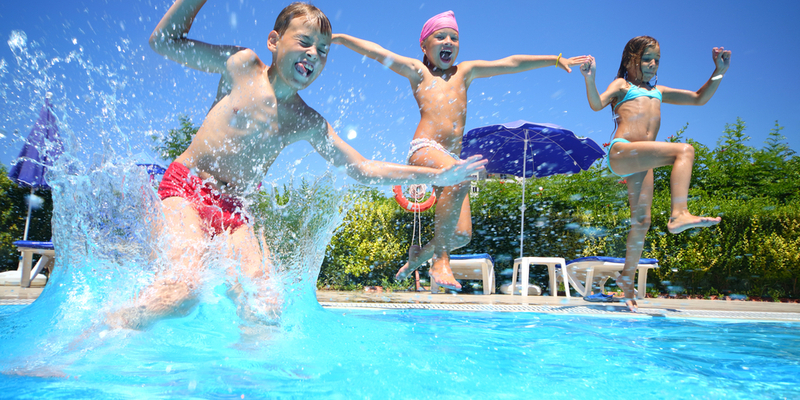 If you’re lucky enough to have a pool during these warmer months, you and the kids will probably find yourselves spending a lot of time in it—we certainly will be. You’ll need some games that everyone can participate in to keep all those prune-inducing hours in the water as much fun as possible. Find-a-bottle: Fill a few water bottles—preferably ones that have clear caps—with pool water. Ask participants to turn around while you throw them into different areas of the pool. Clear bottles will be hard to see, and make the game more challenging. For more of a ‘treasure hunt’, toss coins that the kids can keep. Shoulder wars: Play this one if you and your partner (or an older child) are also up for a game! Two older players stand up to their chests in the water, and the two child players sit on their shoulders. The kids then wrestle to knock the other off. Remember: no hair pulling, scratching, eye-poking or poor sportsmanship! Octopus: Play this one if you have a lot of kids over! Choose one player to be the ‘octopus’. They stand in the centre of the pool. Each round, they try to tag the other players who are swimming from one end to the other. Tagged players become another octopus until only one swimmer is left. Slip and slides are a great backyard staple during the heat. Kids love to see who can slide the farthest, who can get their stomach the most slippery or who can reach the end of the mat first. You shouldn’t need any pre-made games for a slip and slide; the kids will have their own races and competitions. Consider making your own slide, though. It’ll probably be cheaper and more effective than one bought from the shops. Roll out your tarp—preferably on an incline. Gravity is a slider’s friend! Place the sandbags on the corners to stop the tarp from moving. Sandbags are essential because they won’t hurt if the kids crash into them. Pre-soak the full length of the tarp using the hose, and pour on some detergent. Position the hose, on, at the start of the slide. Alternatively, set up your directional sprinkler to the side. Ensure that the slide is being lubricated enough. How else do your kids like to stay cool when it gets hot? 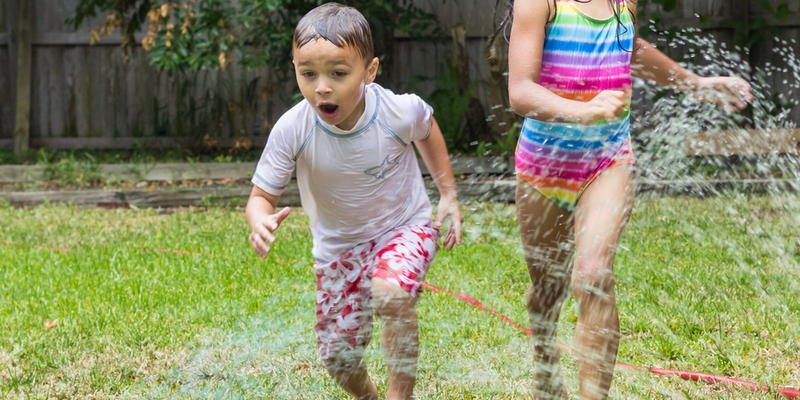 Do you participate in a bit of backyard water-play too?